Hadrian Marlowe, eldest son of the ruler of the planet Delos, is little more than an embarrassment to his father. A wannabe scholiast, he is far from the strong son who could rule with an iron fist in the event that Lord Alastair should die. When his father announces that Hadrian will be sent to study with the Chantry to become a priest, and that his younger brother Crispin will be heir to Delos, Hadrian, with the help of his old tutor and his mother, makes his escape, heading for the galaxy’s seat of knowledge where he hopes to study. Awakening from the fugue state that allows people to travel great distances through space, he discovers that he is farther from home – in terms of both distance and time – than he had ever thought he might be. Determined to make it on his own, he keeps his noble heritage secret, fighting as a myrmidon in the local coliseum. But when his new planet is invaded by humanity’s alien enemy, the Cielcin, Hadrian’s gift for languages will come in useful, and he may just be the one person who can deliver the galaxy from a years-long war and the very real possibility of humanity’s extinction. When we first meet Hadrian Marlowe at the beginning of Christopher Ruocchio’s massive debut, he has lived for over fifteen hundred years, and is a figure of legend, a man who has had many names, and almost as many histories. He has been a soldier and a sorcerer; saviour and destroyer, praised and feared and loathed in equal measure throughout his long and eventful life. 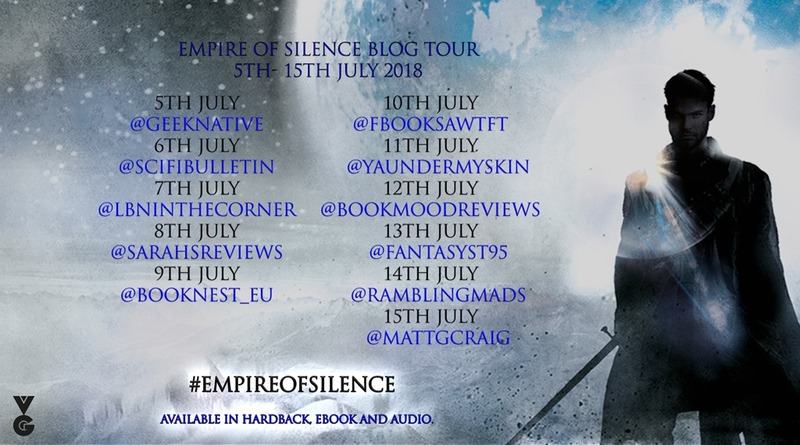 Empire of Silence, the first weighty tome in the story of Marlowe’s life, is galaxy-spanning science fiction meets epic fantasy with a hint of ancient Rome thrown in for good measure. Set some fourteen thousand years in our future, Earth has disappeared, and humanity has spread throughout much of the galaxy. The race has evolved – and, in some cases, been genetically engineered – to adapt to the various planets that now support human life. From the gene-spliced, god-like palatines who rule the worlds, to the lowest plebeian, everybody knows their place, and the boundaries that it enforces upon them. The most important aspect of Ruocchio’s novel, the thing that draws us in and makes us feel that this future is, theoretically, possible, is the effort that has gone into building the world that Marlowe and his friends – and enemies – inhabit. The class system is the least of this, with further divisions for the priesthood and the educated, and those who have decided to live outside the Empire’s rule, such as the Freeholders and Extrasolarians. This is a highly-advanced race, who have developed the ability to travel the vast distances between star systems without stretching the bounds of plausibility; and yet technology in day-to-day life is less prevalent here than it is in our own present, carefully controlled by the religious order that seems to rule side-by-side with the nobility. We see this beautifully-architected future through the eyes of Hadrian Marlowe, one of the palatinate, the son of a planet-ruling duke who has a head for learning, and no interest in the violence that seems to be required to successfully rule a planet. The destruction of the empire’s largest provider of uranium by the Pale monsters known as the Cielcin, puts Delos firmly on the map, and provides Hadrian with plenty of opportunity to unwittingly embarrass his father. When his escape fails to go to plan, Hadrian finds himself on the distant planet of Emesh – a backwater of which he has never heard – and forces him to live the life first of a street rat, then of a member of the local coliseum’s fodder pool, unable to reveal his noble birth for fear that his father will be informed. When his identity is finally discovered, the ruler of Emesh decides to capitalise on Hadrian’s skills for his own ends. The characters who surround Hadrian as the story progresses are a motley bunch, and range from the criminal Ghen, with whom he stands side-by-side against Emesh’s finest gladiators, to the beautiful Anaïs, daughter of Emesh’s Count Balian. But it is when he meets Doctor Valka Onderra, a member of the Tavrosi collective who live outside the rule of the Empire, that we begin to see Hadrian mature, as he begins to discover the gap between the man he is, and the man he wants to present to Valka. Valka, a xenologist, introduces him to the mysterious ruins found in a remote part of Emesh’s southern hemisphere, opening Hadrian to the world beyond humanity, and unwittingly writing his near future. When we finally meet the Cielcin, we discover a race very different from humanity in many ways. Painted as monsters, they have been at war with the humans for a number of years, though the front is many light-years away from the galactic core where much of humanity resides. Most of the stories are legends, with very few people having ever seen one of these monsters, and not many able to speak their language. When a small group of Cielcin crash land on Emesh, Hadrian discovers something very different from the legend, and sees a people who share much more with humanity than either side would wish to admit. It’s a clever trick by Ruocchio that effectively removes the external threat and leaves Hadrian – and the reader – with little to worry about outside the intrigues and politics of the court. The biggest danger to Hadrian – and, by extension, to humanity as a whole – comes not from the outside, but from the ruling classes of the empire: the palatines and, to a greater degree, the Chantry. 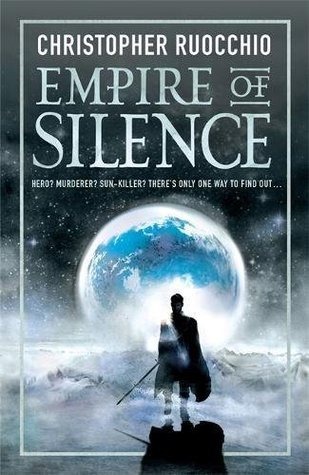 When all is said and done, Empire of Silence is little more than an eight-hundred-page prologue to a much larger story that should start in earnest with book two. Science fiction’s answer to Patrick Rothfuss’ The Name of the Wind, this is epic storytelling at its finest. With influences as far-reaching as Dune and Dan Simmons, Empire of the Sun is, despite its massive size, a fast-moving, action-packed introduction to one of the most memorable characters, and one of the most original and inventive pieces of science fiction produced in the past twenty years, if not more. A self-contained story in its own right, it quite obviously forms the start of a much larger story. Christopher Ruocchio has laid the groundwork for something truly epic, something not to be missed. We can only hope that he’ll break the mould of his fantasy counterparts, and give us regular instalments of this incredible series.